In T4.2 you have the opportunity to check over your production details. Click on one of the fields displaying your stored amounts. After that, you are able to access a table with detailed information about production. 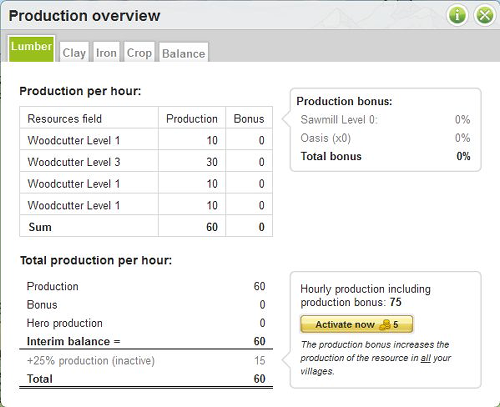 Production per hour: It's the production of each field per hour. You can see level of the field and its current, net production. There you can see a column “Bonus”. Bonus is a production added by constructed buildings or oases. Production bonus: It's a bonus given by buildings and oasis annexed to the village. Its total is given in a percentage. Total production per hour: It is a total production with the addition of your Hero's production. There you can also purchase gold bonus production. 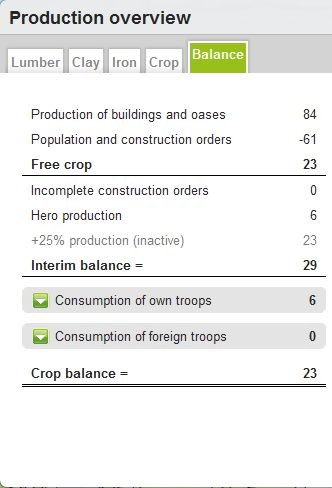 Balance is a special tab displaying free crop, bonus crop production, consumptions of buildings and troops and at the end, the total crop production.